It’s Day 30 of the 30 Day Challenge, and I’m proud to say that I made it all the way to the end without missing a day. Not bad for my first challenge! Off the top, I’d like to thank Rachel from Polished Criminails for getting this iteration of the challenge going and for organizing the InLinkz codes that made it possible for us all to link to each other. And thanks also to all of the other bloggers that participated. I really enjoyed seeing what everyone else came up with. 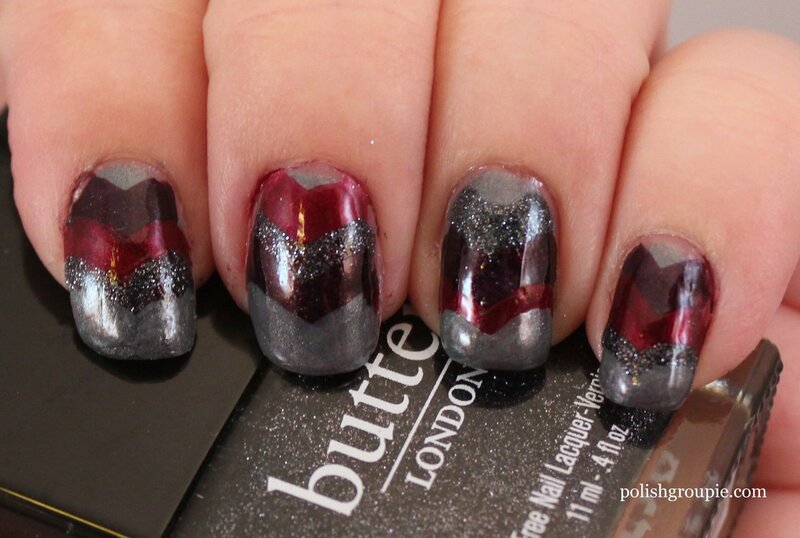 So on to the manicure, which is inspired by a tutorial. It’s based on this video tutorial from IndigoNova1, recreated with a slightly different color scheme. For the base I used Color Club Tweet Me from my September BirchBox, which is a chartreuse creme. I really didn’t like it in the bottle but I thought it would provide a great backdrop to this design, and I’m so glad I tried it out. I like it a lot better on the nail. And first glance I thought it was yellow, but now I see it as more of a green. As far as formula though, it goes on very streaky and patchy. I used three coats here, and had it not been for the fact that I was going to put nail art on top I would have needed a fourth. 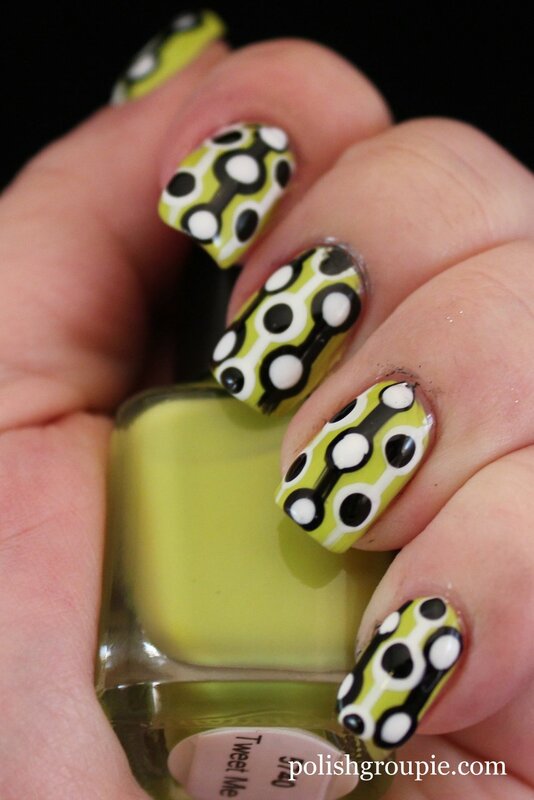 For the dots I used Orly Liquid Vinyl and Ulta Snow White, and then Kiss striper polishes in Black and White for the stripes. As recommended in the notes of the video tutorial, I used the blunt end of a wooden skewer as a dotting tool to create the largest dots. For the smaller ones, I used the head of a pin. This was pretty simple to create and pays off big with a strong visual element. It would look good in a lot of different color combinations. Thanks very much for reading. 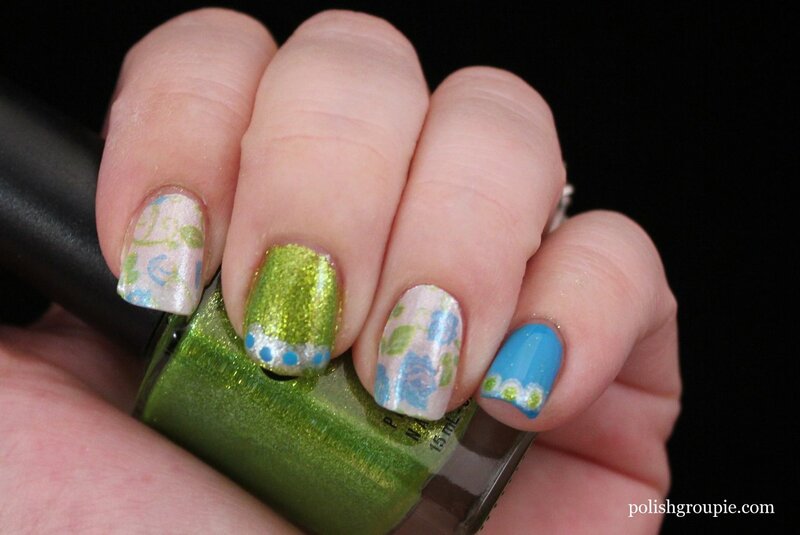 I hope you enjoyed some of the manicures I came up with for the 30 Day Challenge. 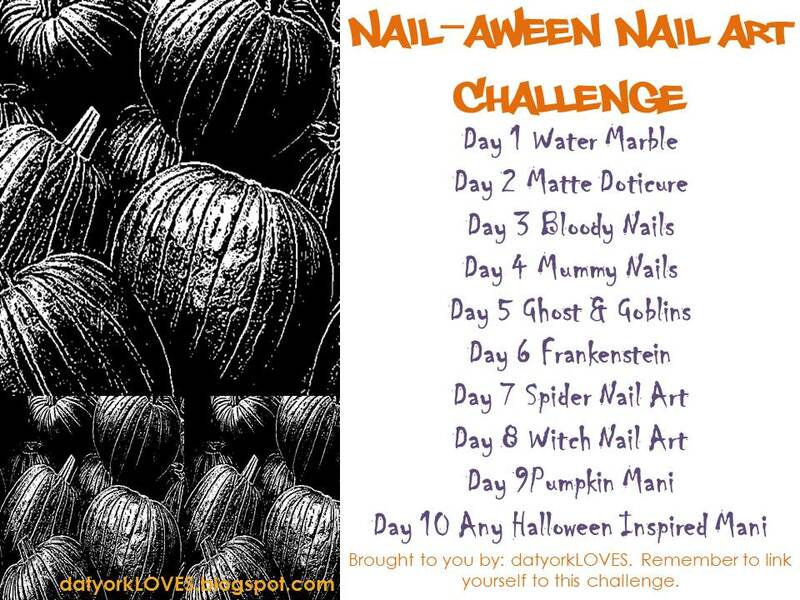 Next up for me is the Nail-aween Challenge from datyorkLOVES (not too late to join, if you’re interested) and the Polish Us Pink Breast Cancer Awareness campaign organized by The Subtle Shimmer and several other bloggers (another not-too-taxing one that you can still join). Please visit some of the other bloggers that participated in the 30 Day Challenge this month. Wow, only a few more days left in the challenge; the end is in sight! 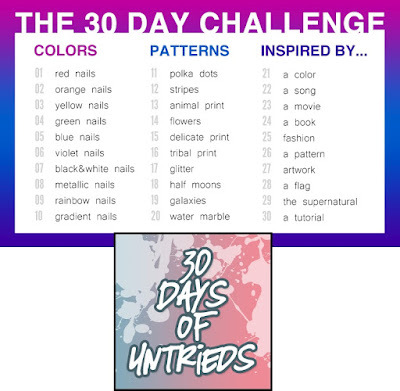 For Day 26 of the 30 Day Challenge, we’re tasked with creating something inspired by a pattern. The pattern I chose was chevrons. I created the chevron pattern with a series of Xs: start with an X made out of color No. 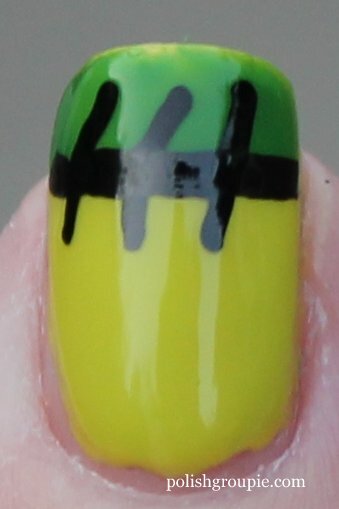 1 at the cuticle end, then lay an X made out of color No. 2 to the right of it so that you’re moving toward the tip. Then color No. 3 to the right of that. It’s not that far off from the technique you would use for a fishtail braid manicure. I alternated the other colors throughout so that they stayed in the same order but I started at a different place in the rotation. 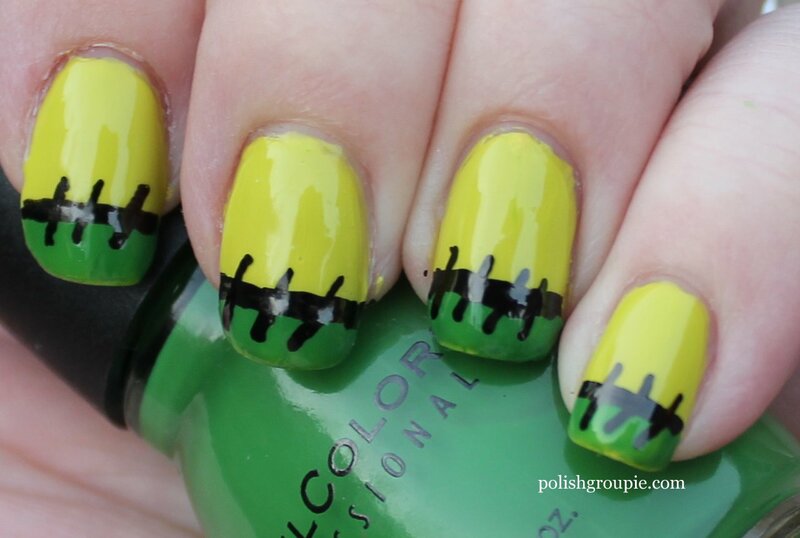 So pinkie is 1, 2, 3, then 3 becomes 1 on the next nail, if that makes sense. 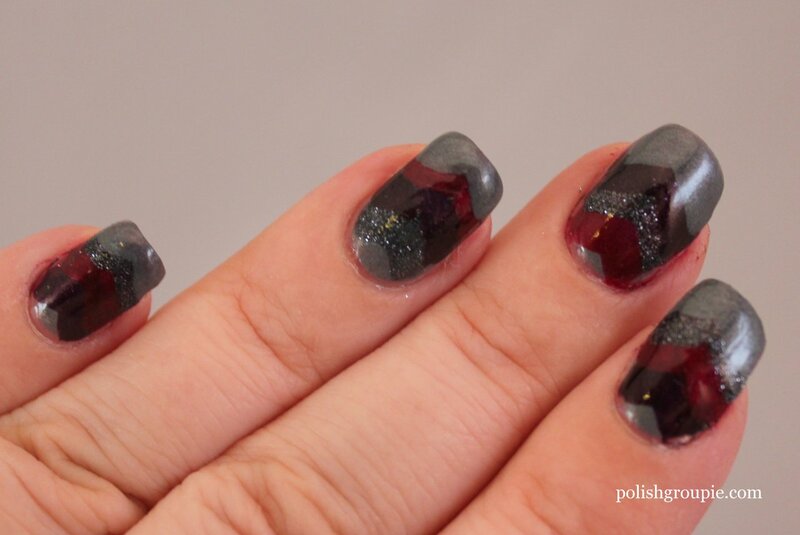 Each nail was then finished with a final X of Sinful Color Slate so that each would have Slate on the tip. I like the pattern on this but I think I would have done better with a different color selection. 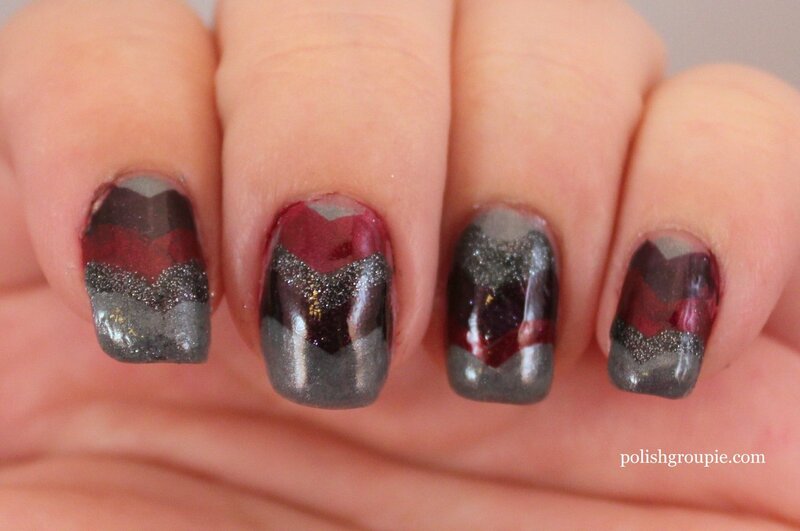 I was aiming for dark fall colors, but it needed a bit more contrast between the colors. Hey, you live, you learn. 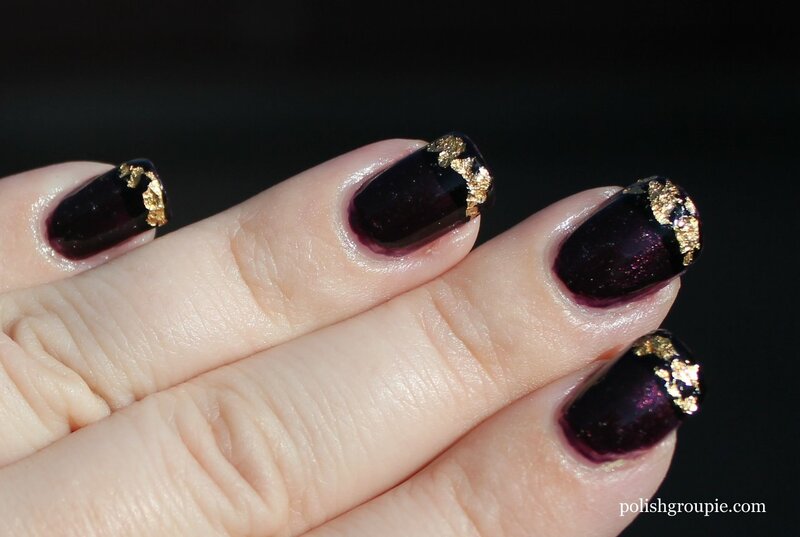 I missed the Emmy Awards Sunday night because I was watching football instead, but I did scan through the photos from the red carpet looking for inspiration for today’s manicure, Day 26 of the 30 Day Challenge, inspired by fashion. I found this photo of Tina Fey and used it as inspiration for today’s manicure. I’d like to note at the top that this manicure looked nearly perfect last night, but by the time I was able to photograph it this morning, I was already experiencing significant shrinkage along the cuticle line from the fast-dry top coat. Sorry! I started with two coats of Color Club Catwalk Queen as the base and then added one coat of Orly Liquid Vinyl on the tips, topped with Poshe fast-dry top coat. Color Club Catwalk Queen was untried for me, for 30 Days of Untrieds. 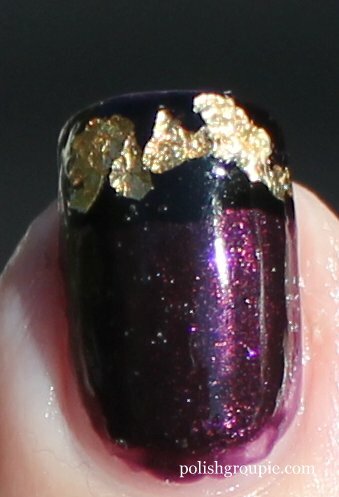 When I was ready to start the gold leafing, I added one coat of regular top coat to the nail, added the gold leafing and then sealed it with Poshe. 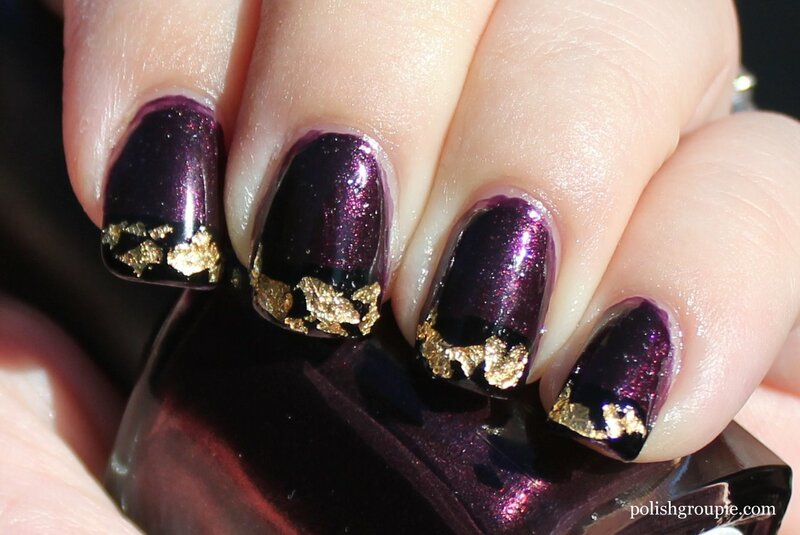 The gold leafing I used is from my stash of vintage nail art supplies. I’m not sure if it’s still available anywhere, but it’s called Nail Nuggets. It comes as one-inch pieces of gold foil. I use an orange stick to rip away small pieces of the foil, dip the tip of the stick in top coat and use that to pick up and place the foil. I’m proud to say I’ve made it to the halfway mark in the 30 Day Challenge, but this particular manicure is a bit of a fail. For the delicate print theme, I wanted to try some Sally Hansen Salon Effects Real Nail Polish Strips, my first time using them (satisfies the 30 Days of Untrieds challenge I’m participating in simultaneously). The pattern is called Vine And Dine, and it features a pale blue flower with green leaves and vines on a shimmery white background. The application on these wasn’t too bad. I used a single strip to cover both my index and ring fingers. They’re a little bit stretchy to enable you to get smooth coverage, which I achieved on my index finger but not on my ring finger (the first one I put on). What I didn’t like was that once on, the strip was a little bit see-through. It would have benefited from a coat of white polish underneath, but the instructions said to put it on a clean dry nail. After that I used two coats of Zoya Robyn (bright blue creme) on my thumb and pinkie, and then three coats of Color Club Fly With Me (shimmery yellow-green) on my middle finger. I tried to do some dot tips with larger dots of A-England Morgan Le Fay (white shimmer), topped off with smaller dots of the alternating color, but the effect did not come out as I had hoped. 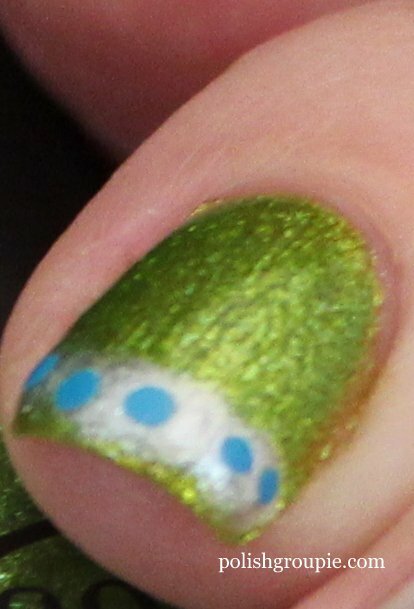 The A-England Morgan Le Fay dots came out looking more like a failed french tip. Oh well. I did like using the nail strips so will try them again some time. Not sure how long the open package will last without drying out but I did tape it back up and put it into a Ziploc bag. Anyone tried Sally Hansen nail strips over polish or do they really need to go directly onto the nail? Summer’s in full swing here, and the heat’s been rolling in. Thank goodness we have a pool! 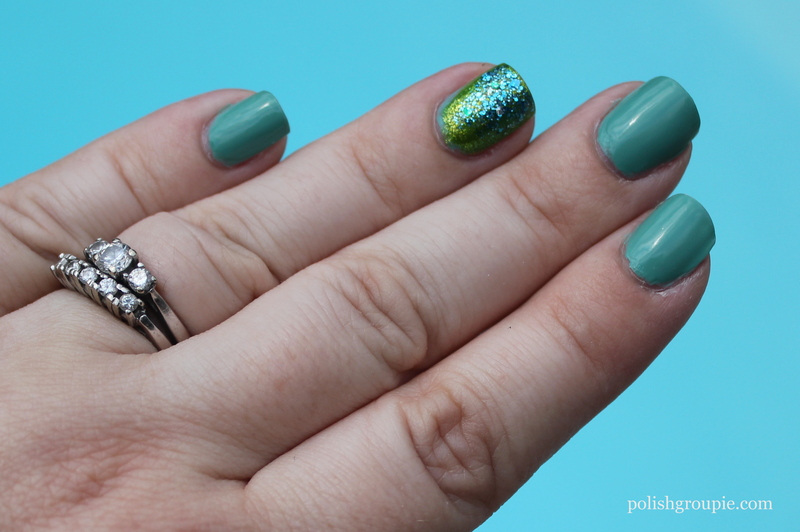 Just looking at that inviting blue water is enough to cool you down, which is what led to this water-inspired mani. 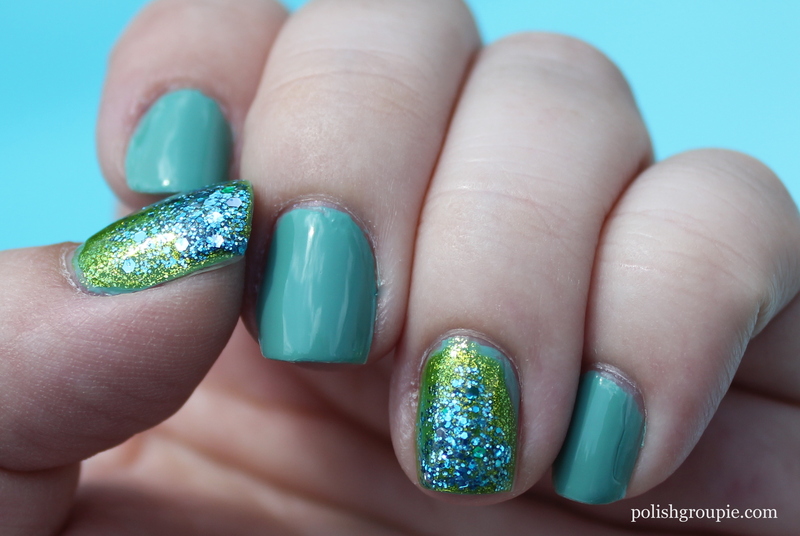 This color combo of turquoise/green/blue brought mermaids to mind, especially with the sparkly aspect of the glitter. 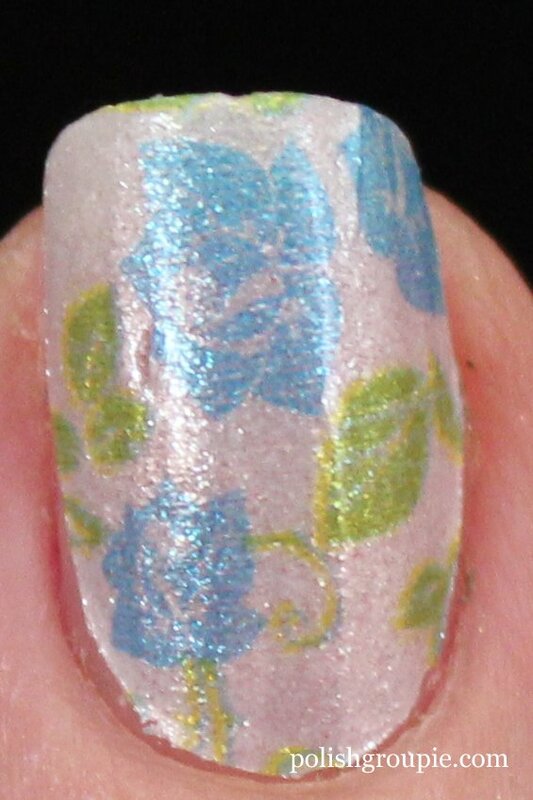 This is two coats of Zoya Wednesday topped with a coat of Poshe. Zoya says Wednesday is best described as a “faded dirty medium turquoise with green undertone and an opaque cream finish.” Well ok then. On the accent nails I added one coat of Color Club Fly With Me, a lime-green shimmer, and then I dabbed Revlon Radiant on the tips to about halfway down the nail. 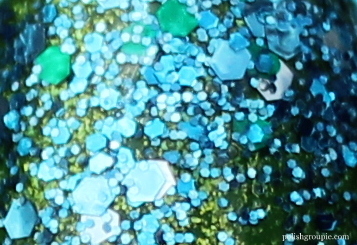 Radiant is a mix of micro and medium hex blue and turquoise glitter plus silver medium hex glitter in a clear base. Topped everything off with another coat of Poshe. 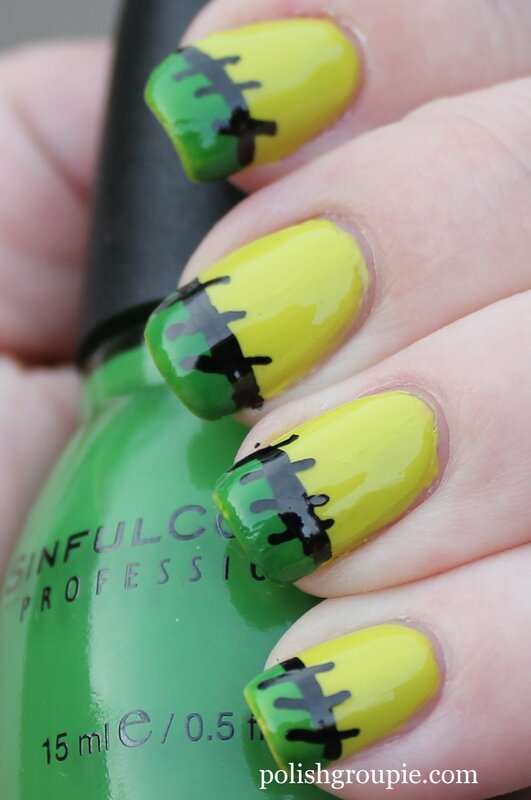 You can see from the pictures that I didn’t do the best job with the application of Fly With Me on the accent nails, but I don’t think it was as bad as depicted here. I think there was a fair amount of shrinkage near the cuticles overnight (did this at night, photographed the next morning). There’s just no way I was that off. 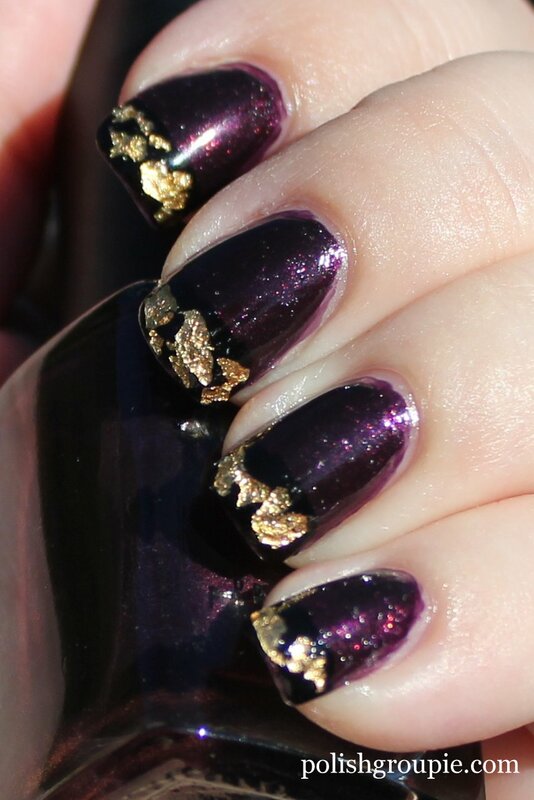 That aside, this was a really fun manicure to wear. I really love this color combo for summer. What colors are you having fun wearing this summer?